Esschert Design Folding Square Bird Obelisk, Rust, 67"
Add soaring style to your garden or landscaping with the Esschert Design Rust Folding Square Bird Obelisk. This unique structure is certain to bring height to your backyard, as well as showcase your love of birds. Its four, square steel legs create a hardy frame, and angle inward at the top to form a pyramidal shape. A metal, bird figurine rests here, lending a touch of whimsy to the piece, and the rusted finish offers an antique hint. Three open squares, each crafted from rounded steel, attach to the obelisk's legs to help maintain its angular silhouette. These 10.25" long and 10.25" wide squares not only add structure; they also provide places for your climbing plants to grip. The pointed end of each leg inserts into soil easily, and the unit is perfect for situating right above a small climbing flower or shrub. Its steel construction remains durable for many seasons, and the folding design allows you to store this obelisk seasonally if desired. 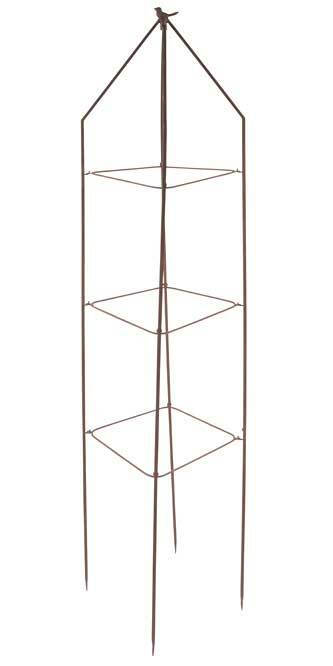 Enhance your landscaping with vertical style using this Rust Folding Square Bird Obelisk. Esschert Design Folding Round Bird Obelisk, Rust, 67"